Tamil Puthandu which marks the Tamil New Year on April 14 will be celebrated today. Tamil community across the globe will observe the festival which marks the first day of the Tamil month of Chithirai with different festivities and celebrations. While Tamilians will celebrate Puthandu, people of Assam will observe Rongali Bihu, Baisakhi in Punjab, Poila Baisakh in Bengal and Vishu in Kerala. The Tamilian community in Sri Lanka, Malaysia, Singapore and Mauritius also ring in the new year with different celebrations. On Puthandu, people clean and decorate their houses, perform puja and visit temples to seek divine blessings. People wish each other on the festival by saying Puthandu Vazthukal. Lakshmi Panchami 2019: Date, Puja Tithi Timing and Significance of The Day to Worship the Goddess of Wealth. The festival date of Puthandu is set with the solar cycle of the Hindu calendar. So it falls on or around April 14 in the Gregorian calendar. The Tamil year is similar to the Vernal Equinox which is marked around March 21. This year Puthandu will be marked on the regular date of April 14. 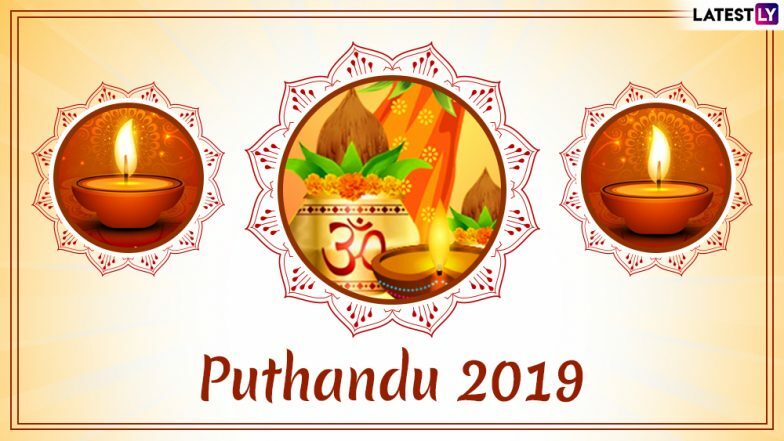 Puthandu marks the Tamil New Year's day and it is thus an auspicious day to embark on new avenues. It is believed that Lord Brahma created the universe on this day. People thus visit the temple and seek blessings. It is a big day of feast and merrymaking for the people. Women adorn houses with kolam patterns. There is a belief that seeking blessings from the divine will dispel darkness for the coming year. People clean their houses and decorate, step out in their best clothes and prepare festive food. People exchange greetings for the day and have a family feast. Youngsters also receive gifts from the elder members of the family.